Polycom VVX 401 / 411 IP Phone | 8x8, Inc. 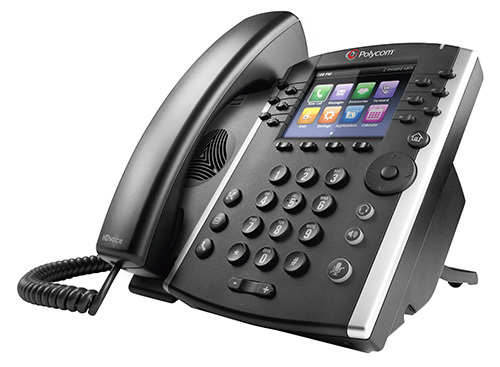 The Polycom® VVX® 401 is a durable mid-range business phone that delivers unsurpassed voice quality and clarity. It provides a high-quality, cost-effective solution for front line staff handling moderate call volumes and improves productivity for office workers. The intuitive color user interface makes navigation easy and requires minimal training. The VVX 401 is also extensible and supports “sidecar” expansion modules as your business grows. The VVX 411 model also comes with a built-in Gigabit Ethernet bridge to connect a high speed device to your phone. 12 line Key Buttons — Use the standard two line keys for managing two live calls on your phone at the same time, and use the others as speed dial keys. Or add-on Power Keys Service to manage up to six live calls at the same time and also monitor the call status of six other extensions — all this without the need for adding a sidecar.